We made it to the June giveaway! 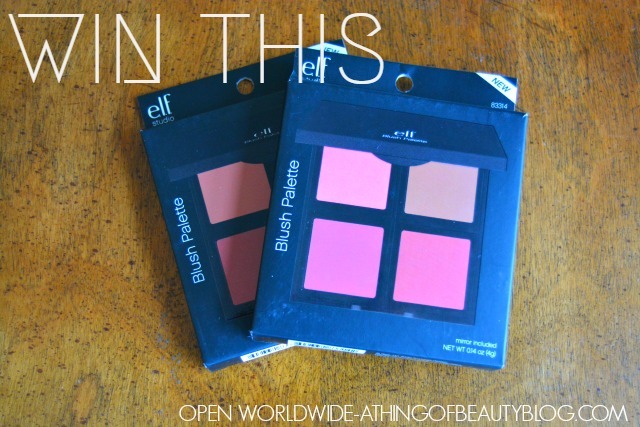 I’m giving away EIGHT elf blushes this month, which equals two of their newish blush palettes. There’s two “shades”: light and dark so there will be one winner who will win both palettes. I’m so excited for this giveaway, you can click here to read my rave review of these blushes. I honestly can’t believe these are just drugstore blushes, sometimes! And after you enter the giveaway be sure to check out some of my other content on here, like my recent post, “The Perfect Cycle Survival Kit for Long Days” or my latest “June 2015 Birchbox Unboxing” video! -This giveaway begins on June 11th at 6am EST and will end on June 26th at 11:59pm EST. -The winner will be contacted by the end of the day Thursday, July 2 and will have 1 week to respond to my email. If you do not respond in this time frame you will forfeit the prize. GIVEAWAY BEGINS 6/11/2015 AT 6AM EST AND ENDS 6/26/2015 AT 11:59 PM EST. TOTAL VALUE OF PRIZE IS $12.00. Hi Miri, please check the widget as I have recently announced the winner. Thanks for entering and be sure to enter this month’s giveaway! I love reviews and tutorials! I love tutorials, reviews, the best and worst products, makeups, travels, cook…. I love to read the makeup and product reviews. My favourite posts are the product reviews so that I can learn and research new brands! 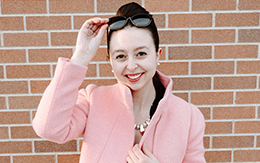 My favorite blog posts are beauty reviews! Makeup, skincare and all around beauty blogs, especially with new product reviews and/ or giveaways. I love to read posts on beauty (skin care, make up, etc.) and fashion. Thanks for the giveaway! I love reviews and tutorials. I like reading reviews, as they are very useful. I like posts that are detailed reviews with photos! Or tutorials! Would really like to win. It is my first giveaway participation. I love tutorials and review posts. I like to read make-up reviews and beauty tips. My favorite posts to read are new drugstore releases, elf product reviews, swatches, drugstore dupes and swatch/comparison posts. Hi! Some of my favourite blog post to read are about the best beauty products, the beauty trends, beauty tips, fashion looks, and fashion trends etc. Outfit of the day posts are my favorites. I love makeup, hair and kid toy reviews. I love how to apply eye make up posts. I like to learn new techniques. I love makeup review blogs. I love makeup tutorials, hauls and also empties posts. Thanks for this great giveaway, Kelly ! I’ve heard good things about their blushes so I would very love to win ! I love make up and skincare reviews, especially mascara and anti ageing products. I really like tutorials or product reviews. I love seeing honest opinions of products I’ve been wanting to try.